The latest adventure I decided to embark on is jewelry making. Making jewelry is in my blood. My grandfather, aunt and father all have made beautiful jewelry for a living. My father even made my sister's gorgeous engagement ring. I will never make fancy jewelry - but I thought I'd give it a whirl with beads. I went to a local bead store and they showed me the best stretchy string to buy along with glue to hold the string together. I love necklaces with tons of strands. I planned on using these beads to make as many strands as possible. So I cut the Stretch Magic string to the length that I wanted. I had no idea how to stop the beads from falling off the opposite end so I used a piece of tape. I poured some beads in my hand and began stringing them on one by one. It took me about 45 minutes to string all these beads on. Not sure what I was watching on tv in the background - this is the perfect activity to do in front of a tv. At this point I stood up, with the necklace in hand, to look in the mirror at the length, assure it was just right. I bet you can guessed what happened. I managed to find almost all of the beads. Following the instructions of the lovely lady at the bead store, I tied two over hand knots (right over left) then one more (left over right.) As I pulled it tight, I put a drop of the cement glue on the knot. It seemed to hold together well after 15 minutes of drying. I even made another necklace that night. Today I wore both lovely necklaces to work yesterday. 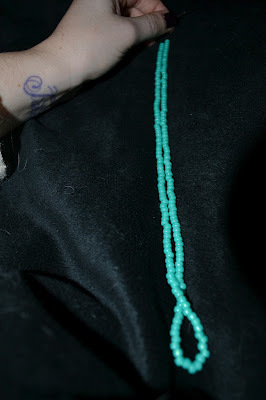 Unfortunately, the knot came loose on one of the necklaces and another gazillion beads fell to the floor. Looks like I have a lot of practice ahead of me with tying knots. 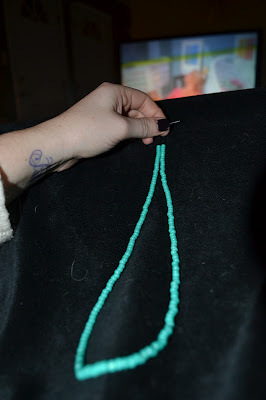 Overall - I love making bead necklaces. I see many in my future. I'll keep you posted!